There are a number of circuits to follow in the Torres Del Paine National Park in Chilean Patagonia in either a West to East or East to West direction. You can hike the popular W-Trek (in red in the map below), the O-Trek (which is the W-Trek + the back side of the park / in blue in the map below) and the Q-Trek (which is the O-Trek plus the tail of the park / in yellow in the map below). Or you can do portions of these circuits. Read a little more about the circuits in this overview article. The circuits are indicated on the CONAF map below. Although I did parts of the W-Trek from East to West, the folks at Erratic Rock Hostel (who give the daily English lecture in Base Camp on hiking in the park) recommend that you go from West to East. Continue on the bus from the park entrance at Laguna Amarga to Pudeto. Take the ferry at Pudeto across Lago Pahoe to Refugio Paine Grande and hike 11km to Refugio Grey (4 to 5 hours long). 2km before Refugio Grey is Mirador Grey (the lookout to Glacier Grey). Just after Refugio Grey you can climb some rocks and get a good view of the eastern side of Glacier Grey. However if you trek forward for about 1 hour towards but not all the way to the Los Guardos campsite (which you would stay at if you are doing the O or Q Trek), you can view the southern ice field behind Glacier Grey. This is the world’s third largest ice field after the ice fields in Antarctica and Greenland. Return back to Refugio Grey and either stay at the lodge or in the campsite outside the lodge. Hike from Refugio Grey to Refugio Paine Grande (which you should do in 3 hours –it’s quicker returning to Refugio Paine Grande than walking in the reverse direction). Paine Grande is the highest mountain peak in the park at 3050m. 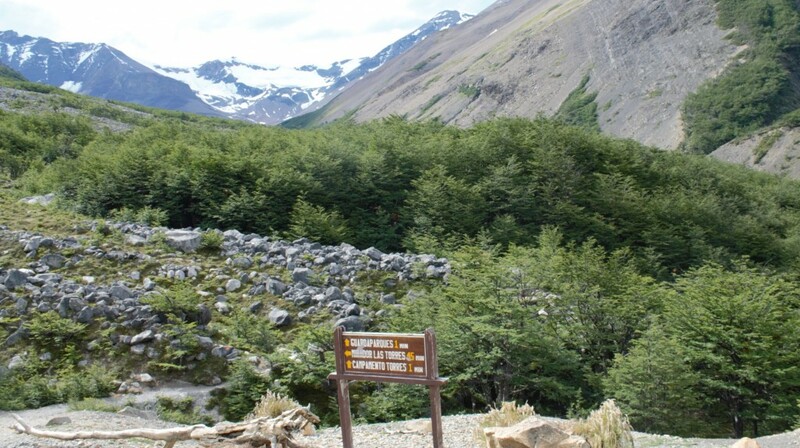 From Refugio Paine Grande it’s a 2 hour (7.5km) hike to Campamento Italiano, a free campsite where you spend the night. From Campamento Italiano visit Valles Del Frances and return back (5 hours, 11 km). Then head to Refugio / Cabana / Campamento Los Cuernos which is 1 hr or 5.5km away to spend the night. The route is relatively flat but there are high winds in this area. Head from Refugio / Cabana / Campamento Los Cuernos to Campamento Las Torres, via the uphill shortcut route and a further 2 hours from Refugio Chileno. Once you have set up your gear at Campamento Torres you should have time to hike up to Mirador Torres to see the 3 peaks of Torres Del Paine before returning to camp. It is recommended that you get up early and leave an hour before sunrise for Mirador Torres again, to check the 3 peaks of Torres Del Paine being lit up by the early sun rays. You should wear light gear but carry your mattress, a sleeping bag, warm clothes, food and coffee to enjoy the view even if it is cold and raining. If your sleeping bag gets wet don’t worry – you should be sleeping in a dry bed in Puerto Natales tonight. Just enjoy the view up there before heading down to Campamento Torres to collect your stuff and heading pass Refugio Chileno and Hosteria Las Torres to the pickup area where you can get the 2pm shuttle to Laguna Amarga for the bus back to Puerto Natales. For 3, 4 and 5 night itineraries on hiking at Torres Del Paine, check out Backpacker Steve’s Blog where he provides plenty of details based on his camping experience. Before you make any decision have a look at a map of the park, familiarise yourself with the refugio, campamento and mirador locations. This will make it much easier for you when reading other blogs and articles on the various itinerary options. 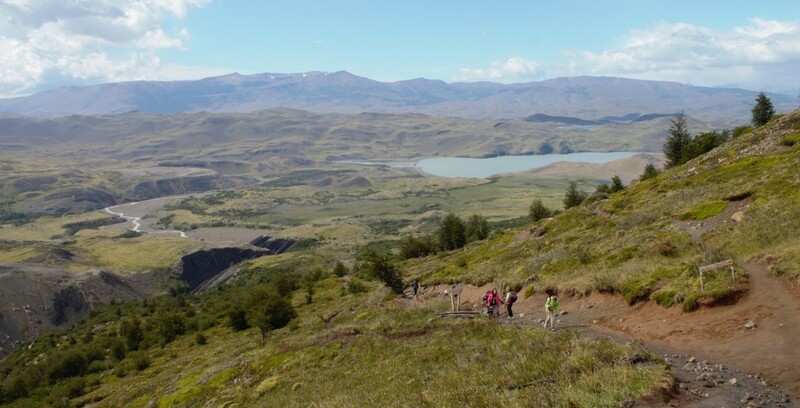 On Day 1 arrived by bus to Laguna Amarga and took the shuttle to Refugio Torres Central. From here I trekked to Refugio Chileno. I left my bags at Refugio Chileno and trekked to Mirador Torres for a view of the 3 peaks in clear weather before returning to Refugio Chileno for the night. Refugio Los Cuernos in the centre of the park had no availability on that day and it would have been a very long trek if I tried to cross the park on foot in one day so I decided to break up the trek and continue from the Refugio Paine Grande side of the park on the next day (with a little bit of backtracking in the direction of Refugio Torres Central). On Day 3 I took the shuttle from Refugio Torres Central to the park entrance at Laguna Amarga and caught the bus to Pudeto. I took the ferry from Pudeto across Lago Pahoe to Refugio Paine Grande, dropped off my backpack and trekked to Campamento Italiano and back to Refugio Paine Grande. On Day 4 I trekked from Refugio Paine Grande to Refugio Grey. On Day 5 I trekked from Refugio Grey to Refugio Paine Grande passing Laguna Los Patos. I then took the ferry across Lago Pahoe to Pudeto and got on the bus to Laguna Amarga and then back to Puerto Natales. Journeying into Chilean Patagonia is something that everyone should try to do, if it’s in their means. There are options available for all levels of fitness (including a drive through the park by car and staying in luxury accommodation).